Intlock, developer of CardioLog Analytics, sets pace as a reporting solution for SharePoint and Office 365 with advanced features offering. Intlock, a Microsoft-certified gold partner for SharePoint reporting and analytics, remains dedicated to providing the most advanced Office 365 monitoring solution for enterprise organizations. As many organizations transition to Office 365 and Hybrid- based solutions, CardioLog Analytics has been continuously optimized to integrate seamlessly within the cloud. The developers of CardioLog Analytics understand the specific needs and the challenges that enterprises face, so they have developed CardioLog to constantly keep pace. CardioLog Analytics is specially designed to solve the challenges of remotely hosted, disconnected systems in the cloud, so that enterprises can monitor their Office 365 data as easily as possible. By providing sophisticated, in-depth reports, CardioLog Analytics empowers enterprises with the tool set to take control of their cloud-based portal, understand underlying trends, and use this powerful data to make critical changes. The solution enables organizations to improve adoption rates, enhance engagement, and spark collaboration. As enterprises make this giant leap forward to Office 365, CardioLog Analytics is there to assist them in their endeavers. 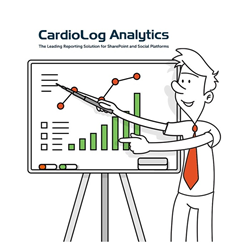 To learn more about CardioLog Analytics for Office 365, click here.